It was almost a year since I last came to this theatre. At the entrance of the theatre, there is the “full house” sign along with the show timing notice & goods-buying notice. There are also the 2 posters of Jinsei and Takirev outside the entrance. The Takirev poster’s picture is similar to last year’s, just that there are additional images added to make it look different? Hmm~ Inside the theatre, there were also the same posters. There was also another poster on some Eye Bank thing. I never really knew what it’s for, even though N-san tried to explain it to me… but the poster had Mori-san, Takki (same pic as shown on the NHK show where he faxed a message to Ohkura), and Kokubun Taichi-kun. And of course there were loads of congratulatory flowers. Flowers to Mori-san were displayed at the foot of the staircase to the 2nd floor. 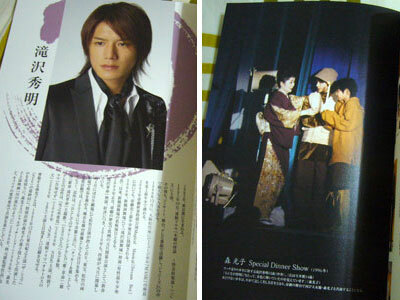 But Takki’s (and Nikki’s, Jrs., etc…) flowers were displayed near the entrance of the theatre. I’ll start with Jinsei’s since there’s only one item in the goods list. I love the size (last year’s was too huge)!! A4 kana~ and it comes with a translucent cover which is really pretty. The pictures inside are so kakkoii! His hairstyle was much nicer than last yr’s too hehe~ When I was flipping this at the theatre on 1/12, I was kyaaing inside! It’s made of cloth, which is brilliant! There is a tiger print in gold on one side, as it’ll soon be the year of the Tiger. And I love the handles coz they are flat! It wouldn’t hurt your shoulders if the bag gets heavy. Best of all, it has a zip!! And this shopping bag was packed in a small pouch too — which can be useful for putting other smaller stuff in it and then putting it inside the shopping bag haha! I don’t really write on hard copy diaries, so I just got myself one of this… to keep! ^^ It has a very nice and sleek design – the cover is hard-clothed kind with tiger print, and the inner pages are white with tinge of red. Photoset A (top row): Mom loves the 3rd one best out of all these 12 photos! But I can’t decide~ I love the 2nd to 4th ones! His smiles are too cute!! Photoset B (middle row): he looks SO YOUNG in the pic where he wears the jacket~ definitely my favourite for this set! Photoset C (bottom row): That “peace-sign” and the 2nd smiling pics are my favourites of this set! The photo album has 20 sleeves, and can hold up to 40 photos, but I usually only put 20 in them – one per sleeve. When I was there, there were 24 photos on sale. #1 ~ 10 are Takki’s . The 3 above are #3, #8 & #10. There were 9 more Takki stage photos released since then, waiting for Kat to bring them back for me hehe~ I think there’ll be one more batch before Takirev Senshuuraku on 5th Feb.
thanks for the posting of the goods. i cant wait to receive mine. i think, i bought 2 pcs of the the shopping bag since it was really useable this time unlike the paper bags before. i’ve been waiting for this kind of bag as their goods. glad to have one. Can’t wait too to get my stash of goods. Am getting the pamphlet, photosets A/B/C, sticker calendar, poster, as well as 10 live photos this time around. Hopefully mine may be a good mix btwn the photos Kat’s getting for u and the ones you have shown here as well. Thanks once again for your informed goods report! i’m not really sure ne, maybe the photo album was only put on sale after the first batch of stage photos are on sale (i.e. on 1/8)?